One night 8 years ago something happened when I was closing at my part-time job, I distinctly remember it. There were no customers. I was doodling on a napkin and my coworker happened to see it. "Whoa! that is SO cool! ", she said, "You should paint that really big!" I remember being surprised - SHOCKED even. To me, it was just a little doodle on a napkin. At that point in my life the thought had never occurred to me to honor one of my doodles - to paint it and call it ART. After graduating college in 2008, I hadn't been able to find a "real" job. I was working two part time jobs, had no idea what I wanted to do with my life, and felt like a failure. I hadn't painted in years. It all started with that doodle. The idea of painting it really big stuck with me. 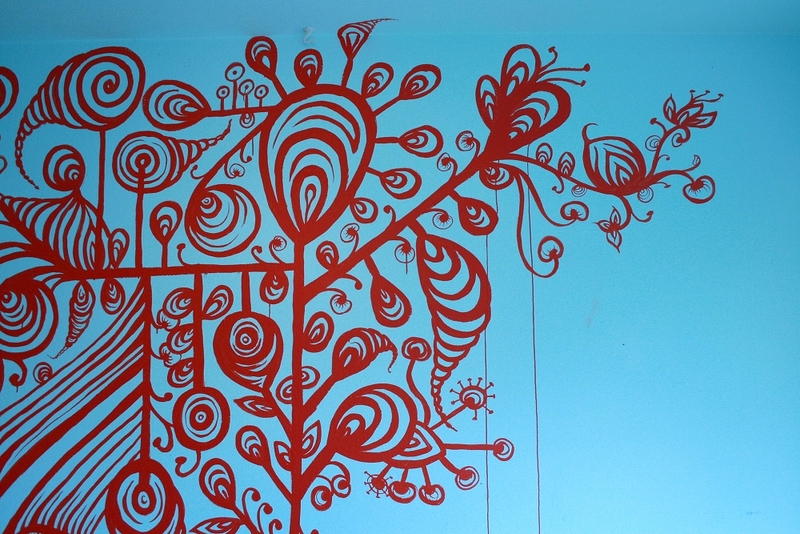 Then one night I found an old tube of red acrylic paint and let loose all over my bedroom wall. I think of that night as the beginning of my art career - it set things in motion. I began to doodle with paint regularly - experimenting and improvising designs. It allowed me to actually enjoy the process of creating, which led me to make more and more art. The paintings below are from that time period - a time before I had ever taken money for my art or knew anything about making prints. They weren't assignments for class, or trying to be anything in particular. They were just me having fun, which was something new. 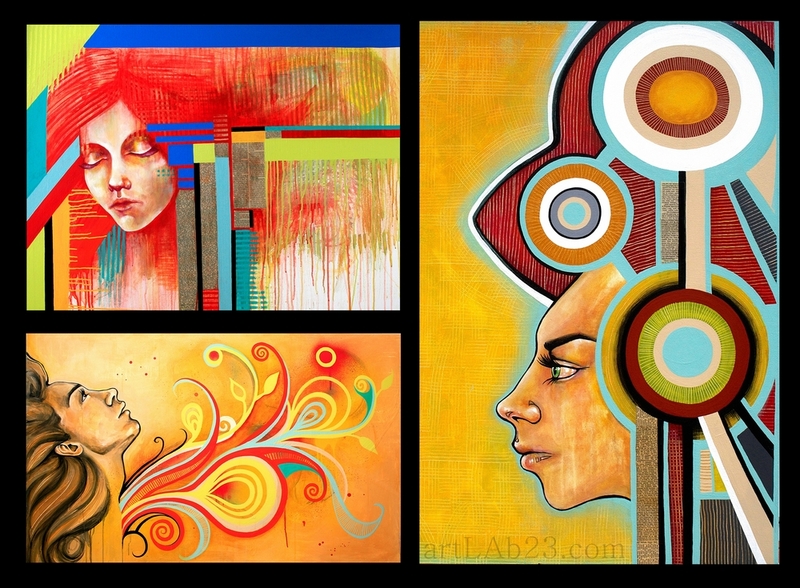 The images below is are from an improvised mural I did at the time (2010-ish). Soon after all this I moved into an artist co-op. While living there I met some people who sold their art on the Venice Beach boardwalk and pushed me to try it. My paintings didn’t look like the art that school told me was important, or what I thought "ART" was supposed to look like. But the response I got from people on the boardwalk showed me that it didn't matter. I started getting attention for my art - but most importantly, it was attention for art that felt true to me. That was the affirmation I needed. The fuel that encouraged me to trust my creative muses and keep going, creating whatever I wanted to create. I had always been trying to do things the "right" way and follow the "right" path. The truth is, there is no right way or path, although society sometimes makes us feel like there is. I finally realized I didn’t have to ask permission from anyone to be anything, and I didn’t have to try to fit into a mainstream path. 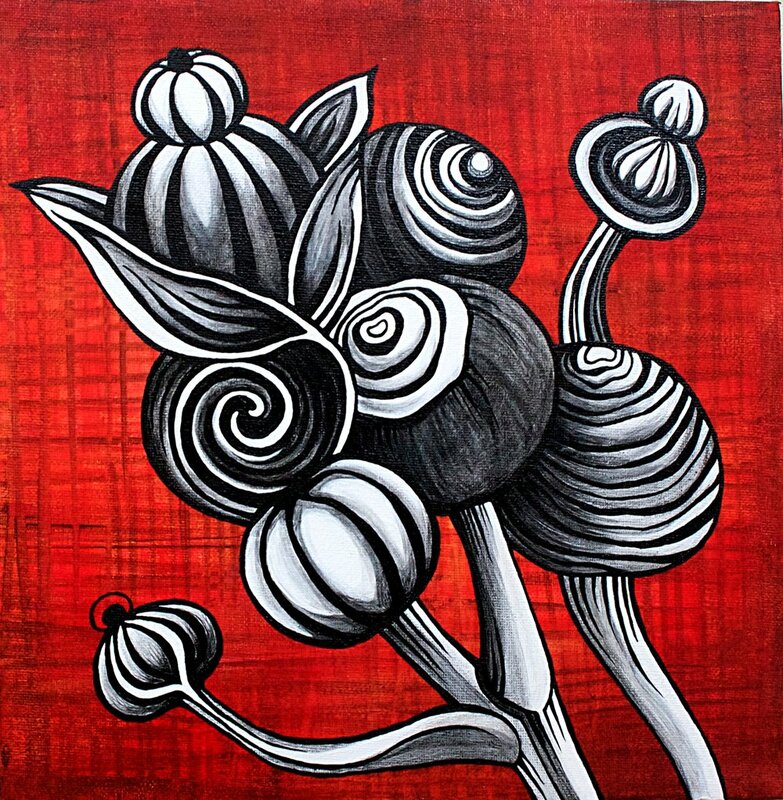 Eventually I quit my part-time jobs - which allowed my growing passion for painting to blossom. It has been fun and inspiring for me to share this with you, and look at how my art has evolved over the years. I hope this inspires you to follow your own path in art, and your life. Please comment below about your own creative journey! I was recently commissioned to do a 2.5'x4' custom jellyfish painting - I'd like to share my process of creating it with you. The client was very open minded and said two little magic words I long to hear when it comes to custom work, "Go Wild!". It is such an awesome feeling when someone loves your art enough to just let you do your thing with a soon-to-be-theirs painting. Excited to get started, I went and found some beautiful blue paint at the hardware store for the background. Ahhhh this blue soothes my eyes. I had to have the painting done in 2 weeks. Unfortunately, right after these photos I got sick and spent about 5 days in bed, wanting to get started but not feeling physically able to. This gave me plenty of time to visualize in my head, so by the time I felt better I had a pretty clear idea of the composition I wanted to do. I've looked at enough jellyfish photos to remember their general characteristics, so I didn't need to look at a photo for this painting, I just used my imagination. I began by improvising and laying out the basic shapes and composition with a lighter blue paint, trying to give the feeling of floating and slow graceful movement. I watered down the paint to make it thin enough to create drips, and waved a wet brush over the canvas to create splatter droplets. I really like the spontaneous look they give to a painting, also the splatter reminds me of underwater bubbles. I began at night, improvising the composition with watered down paint. I love contrast and popping colors so I thought red would be a great contrast with the blues. I wanted to give the jellies and glowing effect so I added yellow to the mix. Using opaque house paint and acrylic is great because you can go layer by layer, and always paint over something if you don't like it. This allows me to improvise as I go, tweaking things here and there. Added red and yellow for more contrast, and more paint splats. Next, I worked on the bottom jellyfish in detail with acrylic until I was happy with the look so I could use it as a model for the other two. Worked on bottom jelly in detail, then used it as a model to complete the other two. Once I got the other two matching the bottom one I just tightened up the details and refined them further. I added a red and yellow outline to each jellyfish to really make them pop. Then I used a darker blue to paint around the edges of the canvas to add to the glowing effect. Refined details and added a red & yellow outline to jellies to make them POP! The custom clients were very happy with their painting, which made me incredibly happy! I really enjoyed creating something special for someone knowing that they will have it on the wall in their home for years to come. I hope you enjoyed this inside look at my creation process. Hopefully it inspired you to get your own creative juices flowing, and to give me a call to make a custom piece for you or someone you love. A lot of my most recent work has included female faces, and I’ve spent a lot of time trying to make these faces look “real” enough, constantly fixing and tweaking and figuring out the right proportions. When I get caught up in this cycle of perfectionism, sometimes painting is no longer fun and finishing one can start to feel like a chore. Some recent paintings of mine featuring female faces. If I’m not having fun and feeling free and inspired while painting, then why do it? I've learned to use these feelings as a guide, following my own creative spirit wherever it takes me. It’s not always easy to follow though, because I get ideas about what I want my art to look like, or what I think it “should” look like. It’s pretty easy to start comparing myself to other artists with more developed realistic painting skills and trick myself into feeling not good enough. But then I remind myself to just do what feels fun and freeing for me--to take the path of least resistance instead of trying to force something. When I follow the path of least resistance with my art, it usually leads me to something new, which is exciting and sparks new inspiration and ideas. So I recently took a break from painting faces and started a series of large abstract designs which felt like a breath of fresh air. 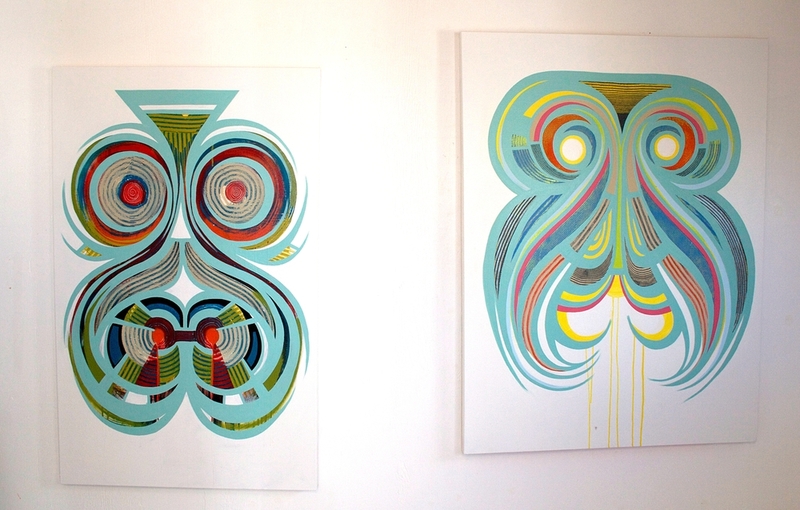 I put on some of my favorite music and just made up the designs as I painted, a fun and intuitive process. 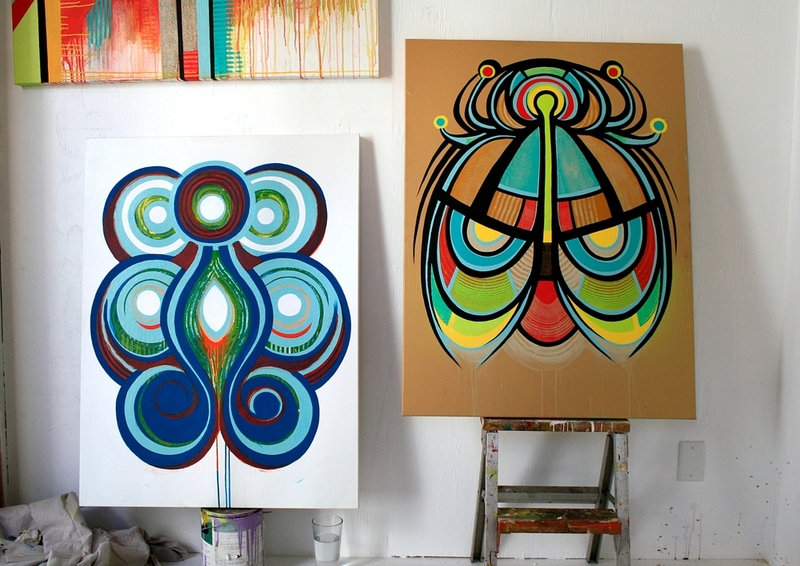 Two new abstract paintings I'm still working on..
Two more new large abstracts on canvas, almost finished. A friend let me borrow some Martha Stewart rubber painting tools which have been really fun to experiment with. They inspired me to create texture, something I haven't really played with much before in my art. You can see close-ups in the next two photos. I know that eventually I will want to paint faces, animals and things again. I also know that as long as I’m painting, I’m growing.. and so is my art. So here I am, floating freely in color, shapes and texture. Creating my own abstract designs that don’t need to look like anything. Existing in a reality free from the confines of right, wrong, definitions and labels. A deep breath of fresh air in and a bold sigh of relief out, “ahhhhhh”. "So, where do you get your inspiration and ideas?" This question just won’t go away. It just keeps coming and coming from people who meet me & my art. I never have an answer for them, so I will try again, here. There is no question that my ideas come from inside me or through me. I might be channeling ideas from some other realm/spirit/energy source/universal mind or my own subconsciousness, I do not know. However, the best I can do is shed some light on the process I use to uncover these ideas. That is how I feel I do it, I uncover them. Sift them out... Find them... Discover them. You’d think for a visual artist I’d spend my time doodling to come up with ideas. Well I don’t. I can doodle and create visually in my mind. It’s a lot faster that way and easier to change things. For me, the real meaty process of coming up with ideas is writing. When I do stream of consciousness writing (writing whatever comes to mind immediately without stopping) it's like I stab a spicket into my temple and turn the faucet on and let the juices flow out of my head all over the page. Words, phrases.. things that make sense and others that don’t. Mundane rambles and philosophical rants. Narcissistic self obsession. I let it all go baby, judgement free. It’s only me, my inky gel roller pen and this piece of blank paper--no lines, no rules, no structure. I must have this pen--no other pen will let me flow as freely as this one. So I turn on the faucet and let it all rush out of my brain. Some days it’s a slow trickle, others it’s a full-fledged flood gate opening as the words just pour out. I barely think about what I’m writing and wonder what sort of energy creature has infiltrated my body as I watch ideas that I hadn’t consciously even thought of before flow effortlessly from my fingertips. Sometimes it flows so fast I can barely keep up. I’ll have multiple ideas trying to come out at once but my hand can only record one at a time. After it’s done I am left with pages like the one in this picture. 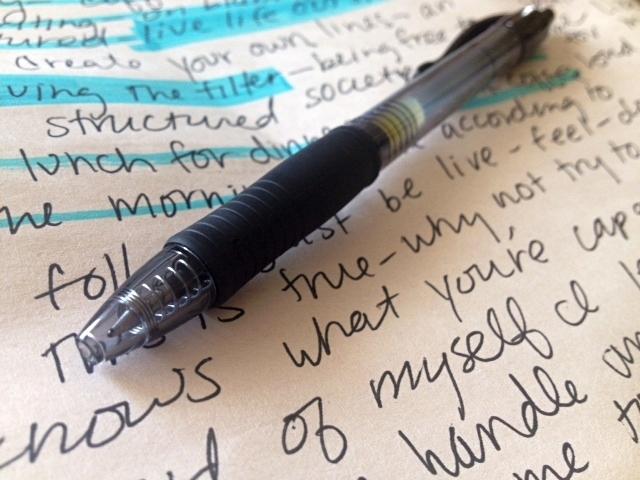 Chaotic, hand scrawled words peppered with nuggets of golden ideas. I see it as my job to regularly turn this faucet on and get it all out, then go back and edit later. So I go through it (as you can see I did with a blue highlighter) and pick out the golden nuggets--the next big idea for a painting, blog post, business thing, life goal, and occasional revolutionary, mind-blowing spiritual epiphany. Sometimes I get lazy and put off the going through it part. Then I end up with these pages piled up in boxes, all ripe with hidden golden nuggets. On a particularly idea-less day I may grab a highlighter and go treasure hunting through these old pages. So like I said before, I have no idea where exactly my ideas/inspiration come from. It all seems to me like some sort of subconscious digging or energy channeling. So if you want to have more creative ideas, try this process out. You may be surprised at what comes out! 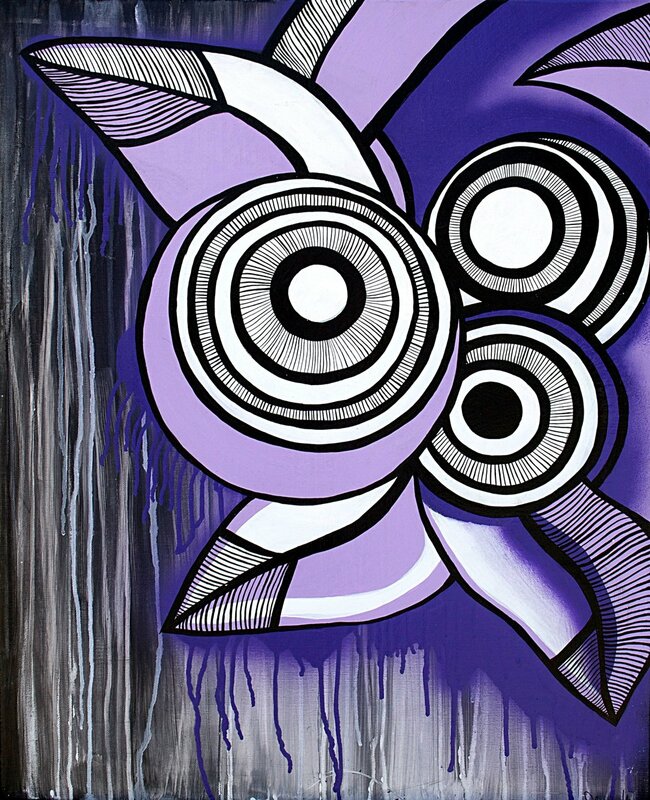 "Unleashed", a new acrylic & spray paint painting on canvas by carissa for artLAb23. digital print available here. I’m waiting for you to express that little voice deep inside of you. That little voice that gets excited about your ideas... Your goals... Your creations. That little voice that dreams about what you could be, what you could create and how the world could be. I’m waiting for you to... Let go. Let go of what others think and what they expect you to be. I’m waiting for you to be you. Naturally you. Vulnerable. I’m waiting for you to release your fears of judgement, criticism, and comparison. I’m waiting to see you...The real you. Don’t be afraid. Be you. Unquestioningly, unafraid, unapologetically, you. You will become a spark. A spark that ignites others to do the same. I’m waiting for you to start that side project, that piece of music, that painting, that business, that sweet personal goal. I want to see you create. We all do. We want your voice, your expression, your ideas, your creations. We want you to unleash your true self on this world. I’m waiting for you... We all are. To purchase an 8x10 print of "Unleashed" click here. Here is the first post in a new series of posts I call, "Venice Beach: A Love/Hate Relationship", chronicling my experiences and feelings about selling my artwork on the boardwalk. My Venice table setup display on May 2nd, 2014. 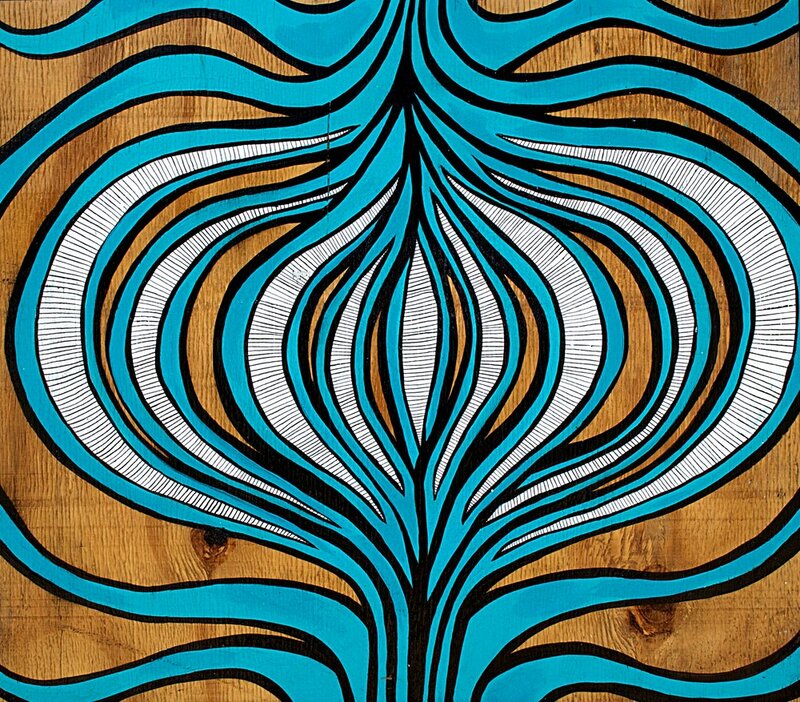 I make a living right now selling mini-sized prints of my original paintings in Venice Beach. A few years ago I figured out how to make prints through experimentation and have since evolved from there. This arrangement has proven to be very good for me and has allowed me to connect with people through my art in a way that I never could have imagined. There are so many reasons why I'm grateful and I love selling in Venice. First, it frees me up to not have to have a regular day job. This allows me to control my schedule so i can live in an unstructured way--to follow my inspirations when they come and work on a project or idea for days in a row if i see fit. NOTHING beats being your own boss. However, selling in Venice is not always easy. It’s dirty and even smelly in some places. Spots on the boardwalk are on a first come first serve basis, so you could end up right next to people trying to peddle things they found in the dumpster. The sun beats down and the glare, you can’t escape. The noise, the distant incessant drumming of daily drum circles. The trash... the grey, dirty, bird poop stained concrete. There’s an addict zoning out, sitting right behind me. There’s a filthy trash can that people dig through for plastic bottles right next to my table that reminds me exactly where I am. So let’s face it, I could be looked at as a total societal outcast for doing what I do. Some days I can’t escape the fear of being seen as a “street artist”, and sometimes I don’t feel successful because of where I am. I feel a little bit of dread each time I tell someone that I sell on the boardwalk--that suddenly it might negate my professionalism as an artist. But every now and then, there’ll be a day when it feels simply amazing to be out there. I’ll be listening to a live musician a few spots away that sounds really awesome. I sip an iced coffee and some people walk up and buy some prints and I don’t even have to try to sell them. Others are next to me selling their craft and I feel so inspired being surrounded by creative eccentrics who have given up caring what society thinks of them long ago. I look around and smile and feel eternally grateful to be exactly where I am. The famous & inspiring Douglas LaMarche, a Venice Beach legend! Everything suddenly starts to look beautiful. A homeless man asks for money with a cardboard sign, but still manages to make others laugh with a joke and a smile. Dogs happily sniff away as their owners stroll down the walk hand in hand. Sunlight glitters everywhere while the guests on the restaurant patio enjoy the music and are generous with tips. Free spirited, hippie hoola-hoopers rhythmically spin their hoops round their hips to the music. I become overwhelmed by an amazing feeling of joy and peace and gratitude. The next minute there’s an encounter with someone who’s so inspired by my art they immediately like my facebook page and always want to see what I create next. Then I realize that I brave the boardwalk madness for these encounters, and it reminds me why I’m doing what I do. 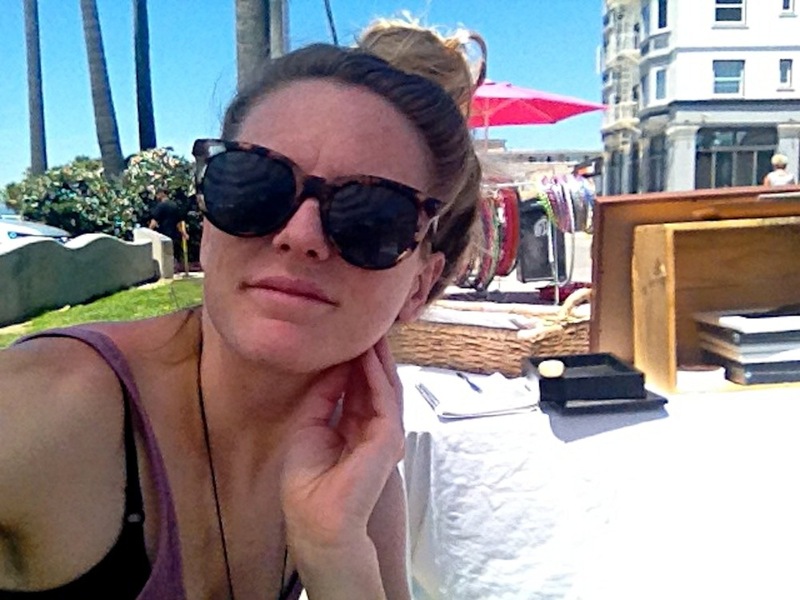 I hope you enjoyed this confession about what it's like for me selling in Venice Beach. I plan to expand more on my experiences there and am looking forward to sharing with you! If you'd like to see more boardwalk photos, you can go to this album on facebook. Thoughts on Owls: The Bestselling Bird! A long time ago I mainly painted abstract shapes. After beginning to sell my work, I realized it was easier for a wider variety of people to connect with my art when I painted more recognizable things, like animals, but in my own unique style. The math was simple--once I started painting more animals I started selling more art. Then the owl trend began. People went crazy for owls! I have to admit, they are cute :) So I wanted to figure out a way to do an owl in my own style. This way owl lovers can connect with my art, and maybe see their favorite little creature depicted in a new way. This was also a fun challenge for me, to take something I wouldn't normally have ever painted like an owl, and try and do it my own way. What could I bring to this to make my version unique? I think that’s where your originality as an artist can really show. When you can take a familiar image like the owl and clearly define your style as an artist by the way that you paint it. Like when a singer covers a great song, do they just regurgitate the same old song, or worse, do it the same but just not quite as well? Or do they completely remake it into their own version so that you appreciate the song in a whole new way? I always hope to make things my own way and further develop my own unique style and voice as an artist. Showing my work in public and getting feedback always builds my confidence as an artist and inspires me to create even more. A question people frequently ask me is, "Where/what do you get your inspiration from?". This proves to be a very difficult question for me to answer. I usually look blankly back at the person for a couple seconds then go "uhhhh....", dumbfounded. People don't seem very excited about that answer. I don't blame them! After contemplating this, I've realized that when I am going to paint or draw I always turn my focus inside to the world in my head. Images usually flicker by, ones I've seen in the past and absorbed, or old paintings or sketches of mine. Some images are stocked away, like a beautiful flower I once saw up close on a hike, or an interesting billboard seen while driving... Diagrams I've seen in textbooks... Other artist's paintings I've liked and seen in the past. A lot of these images are probably corrupted and have morphed from the time they've spent in my memory. But the point is, I turn to my inner self for ideas, inspiration, energy to create and guidance as I go along painting. So when I make art, I really am just expressing my own inner self, as cliche as it may sound. Do you love art and creativity and want more of it in your life? Want to learn more about the process behind creating my art? Then sign up below for my e-mail journal Confessions of a Creative and get inspiration straight to your inbox!